World No. 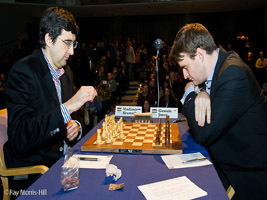 1 Magnus Carlsen had already won the London Chess Classic 2012 before this game ended because Vladimir Kramnik drew his game against Michael Adams. (Report on Chess Blog). 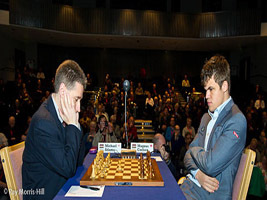 However, Carlsen continued to try for a win. Despite the draw, the game was an exciting one to watch. Replay the game with Chess King. 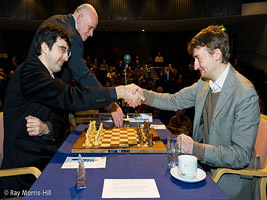 Former World Chess Champion Vladimir Kramnik played his typical steady chess to beat British Chess Champion 2012 GM Gawain Jones and stay in the running for the title at the London Chess Classic 2012. The game was in Round 8. Exchange-down: No problem! One more round is to be played in London. Kramnik is right behind World No. 1 Magnus Carlsen on the leaderboard for the title. Replay the game with Chess King. 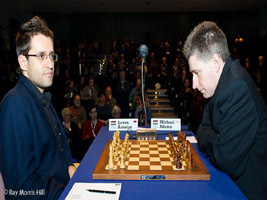 Returning from an Olympiad gold in Istanbul, Levon Aronian took on British top-rated Grandmaster Michael Adams for a steady display of chess where neither could really force the other player down. An entertaining, but interesting game nevertheless… particularly if you want to learn how to move those Bishops! Replay the game with Chess King. 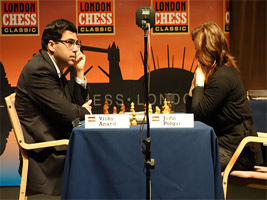 Hungary’s Grandmaster Judit Polgar earned her first win the London Chess Classic 2012 with a victory over GM Luke McShane in the eighth round. Check out the game with Chess King. The final position saw McShane lose a piece for no compensation – the right time to resign. 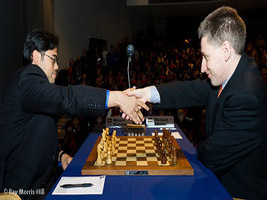 The most exciting games of the London Chess Classic 2012 would probably be the Round 8 encounter between World Chess Champion Viswanathan Anand and US Chess Champion Hikaru Nakamura. The game diluted to an endgame with a plus for White, but soon enough Nakamura had the tide turn in his favor. However, in the nervous tension, Nakamura handed the chances back to White and had to settle for a draw. Replay the game with Chess King. In the position on the left, Black plays 50. …b2 and hangs in for a draw. Black’s 50. …a3 would have easily secured the win because Black would be threatening to make two not one Queen and would not be worried about a checkmate or Queen promotion by White. However, 50. 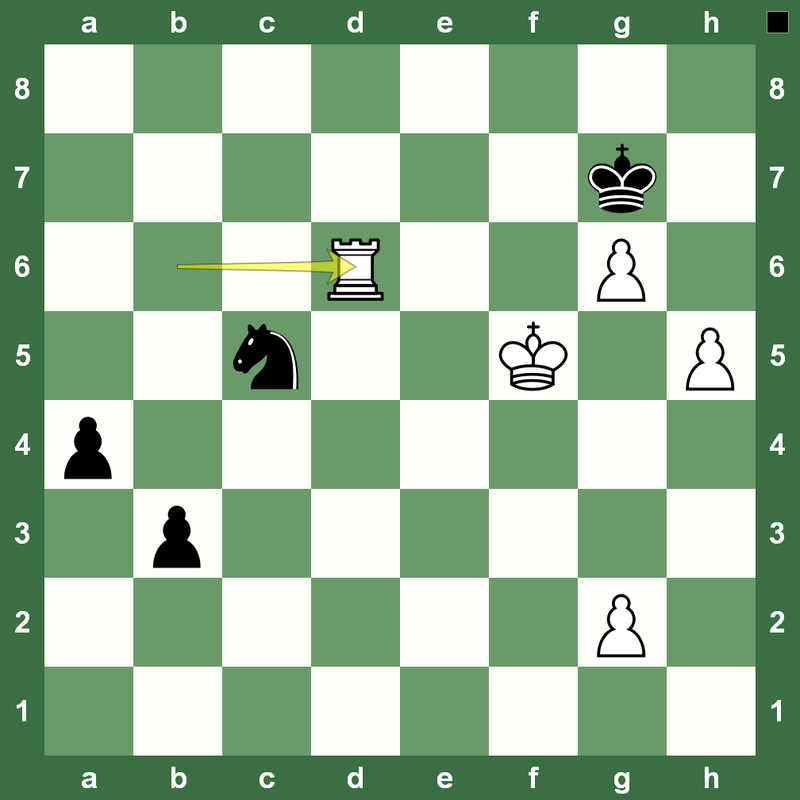 …b2 changed all that and put the pressure on Black. Gawain Jones has his heart set on the f3-Gruenfeld and he brought it along in the seventh round at the London Chess Classic 2012. Yet again, Jones went for a sac, but Levon Aronian knew his path around the maze. Aronian returned the pawn and got the game down to a dead draw. Replay it with Chess King. 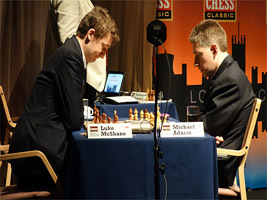 Coming from a victory over World Chess Champion Viswanathan Anand in the previous round, Michael Adams was in a winning-mood against Luke McShane. However, luck was with Luke! McShane was losing all the way, and even got into a mating net, but Adams goofed up. The game ended in a surprising draw. 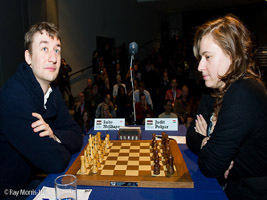 The world chess champion and highest-rated woman chess player came to Round 7 at the London Chess Classic 2012 on a low. 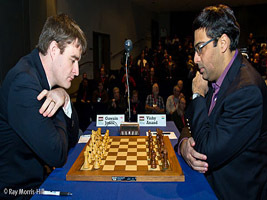 Viswanathan Anand had gone down in an unbelievable blunder against Michael Adams in the previous round. Polgar has been having a bad event with only half a point so far. Both were in no mood to play it on the defensive. 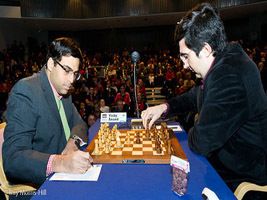 However, Polgar’s attack and Anand’s rock-solid defense had just one outcome – a draw. Replay the game with Chess King. 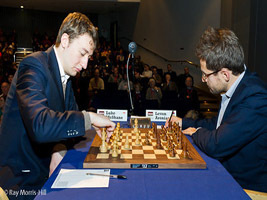 The seventh round at the London Chess Classic 2012 was all set for an attacking clash between World No. 1 Magnus Carlsen and US Chess Champion Hikaru Nakamura. The American went for the 2.c3 Sicilian and invited a sacrifice for three pawns from the Norwegian. But, Hikaru Nakamura got back into the game neutralizing Black’s passed and connected pawns on the Queenside. Black’s fortress brought the game down to a draw. Replay the game with Chess King. Former world chess champion Vladimir Kramnik did his best to strike down World No. 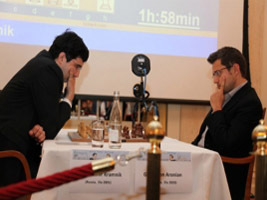 2 Levon Aronian with two bishops, but the Armenian held his ground. Eventually, the game ended as a draw. 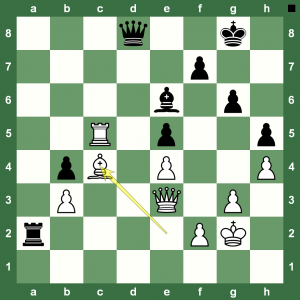 Replay the solid defensive game based on the Berlin Defense from Round of the London Chess Classic 2012 with Chess King. Luke McShane was in no mood to show any mercy to fellow British Grandmaster and a sac-addicted Gawain Jones in the sixth round of the London Chess Classic 2012. 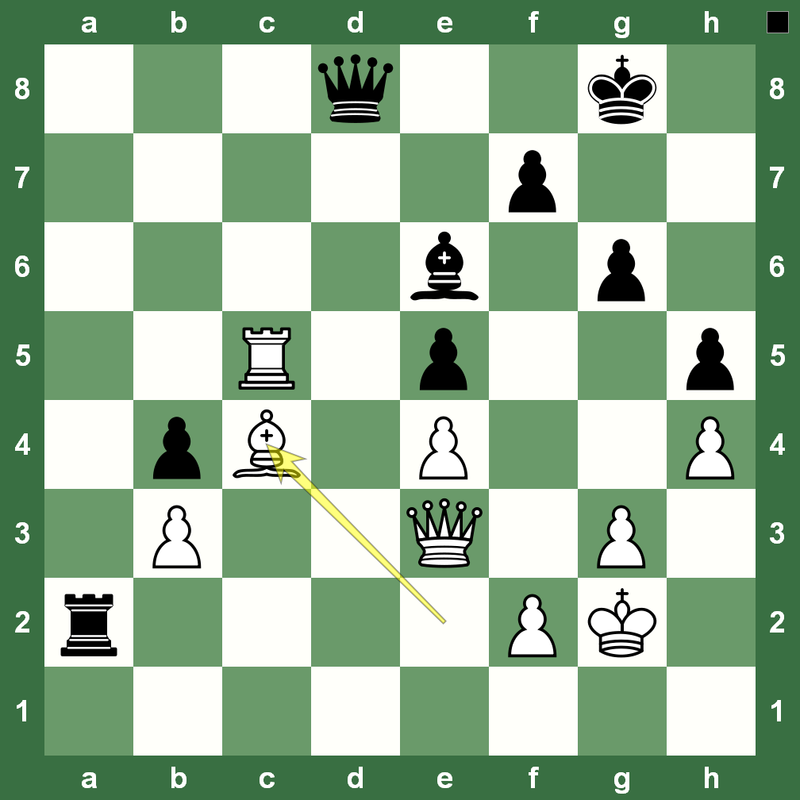 A theoretical English Opening led to a nice attack down the center as White won the game. Replay the game with Chess King. World No. 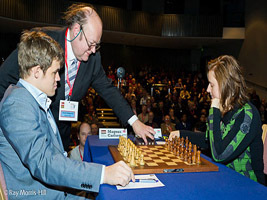 1 Magnus Carlsen made short work of the highest rated woman chess player, Judit Polgar, in Round 6 of the London Chess Classic 2012. Here is the cool game with the White Rooks infiltrating the Black ranks with sheer devastation on their mind. Replay the game with Chess King. Round five of the London Chess Classic is going to be remembered for the unbelievable blunder by World Chess Champion Viswanathan Anand. Can you see how Black can win? Anand has just played 41.Bc4. What’s Black’s killer move? Michael Adams took his time and eventually played the winning move that forced resignation by the world champion. Replay the game with Chess King. 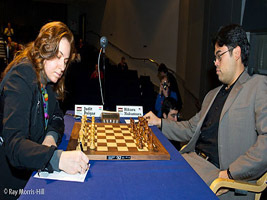 Reigning US Chess Champion versus the highest rated woman chess player: When Hikaru Nakamura and Judit Polgar met in Round 5 of the London Chess Classic 2012, there were fireworks all around. The two aggressive players squeezed the game right down to the last pawn. Eventually, Nakamura prevailed. Enjoy the game with Chess King. World No. 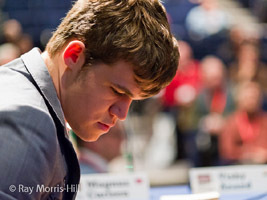 1 Magnus Carlsen is having a brilliant run at the 2012 London Chess Classic. British Grandmaster Michael Adams held steady for much of the game, but just that one inaccuracy and Carlsen pounced for his pound of flesh. An exciting game no doubt. Replay the game with Chess King – the super applet works on just about any device on the planet. 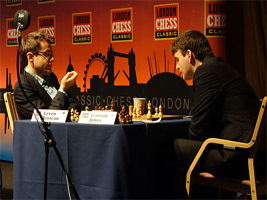 The game of Round 5 at the London Chess Classic 2012 was Vladimir Kramnik playing a delightful game against Luke McShane. Technique, brilliance and, of course, the sacrifices – the game was quite a show. McShane would have loved the chess as well even though he lost. Check it out with Chess King. The fifth round at the London Chess Classic 2012 saw World Chess Champion Viswanathan Anand break a jinx of 17 draws in classical games for the last several weeks with a win over Gawain Jones. Everything seemed to progress fine in the f3 Gruenfeld before Jones self-destructed. Check out the game with Chess King. Another quintessential chess game at the London Chess Classic 2012 that ended in a draw despite reigning US Chess Champion Hikaru Nakamura pushing his luck against Michael Adams. The British Grandmaster held his ground and no progress was possible. The game was a draw. 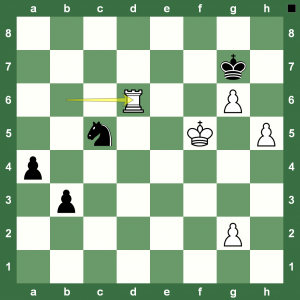 Replay the game in the Chess King applet for some solid defensive ideas. 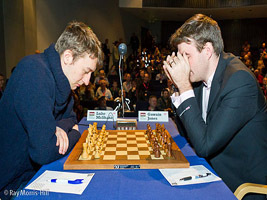 This was the most exciting game of the fourth round at the London Chess Classic 2012. Luke McShane and Levon Aronian put up a display of some creative chess. Fantastic endgame play by both sides before Olympiad champion prevailed with Black. Replay the must-watch game with Chess King. 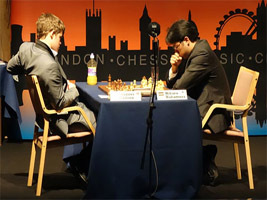 The fourth round at the London Chess Classic 2012 witnessed reigning world chess champion take on a former world chess champion: Viswanathan Anand vs Vladimir Kramnik. However, both knew very well how to handle matters and the discussion ended in an easy enough draw. Replay the game with Chess King.